Star snapped a two-game slide in the 2017 PBA Commissioner's Cup, scoring a 96-90 victory over the Blackwater Elite Saturday at the MOA Arena. Losing control as Blackwater rode the hot hands of KG Canaleta, the Hotshots had to rely on a total team effort in the final period to secure the win. The Hotshots now head into the All-Star break with an impressive 5-2 mark. Import Tony Mitchell led a balanced Star offense, scoring 17 points and grabbing 15 rebounds. Paul Lee meanwhile led six locals with at least nine points as the veteran guard dropped 15. Rookie Jio Jalalon was good for 13 points off the bench. Canaleta led the Elite with 27 points but went scoreless in the fourth period. Blackwater now dropped to 1-6 after losing back-to-back games. Tony Mitchell (STA) - 17pts, 15rebs, 2blks, 1ast, 1stl. Greg Smith (BLA) - 22pts, 29rebs, 6asts, 3blks, 1stl. Charles Rhodes finished with a game-high 26 points, while Arwind Santos scored all of his 13 in a pivotal 2nd-quarter run to help San Miguel beat Rain Or Shine 111-98 in the PBA Commissioner's Cup at Mall of Asia Arena on Saturday. 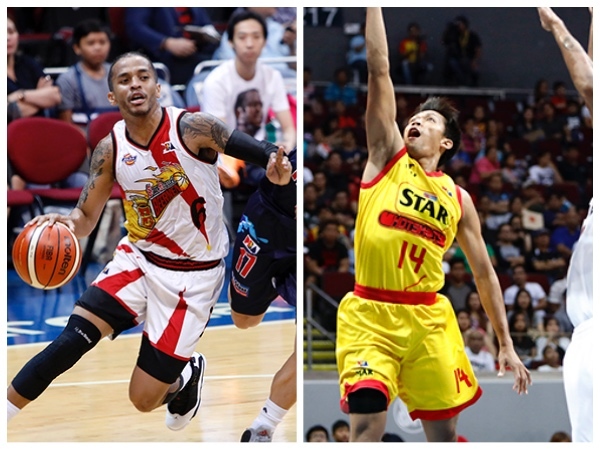 Gaby Espinas, who came off the bench like Santos, added 15 points, 8 rebounds and 4 assists, while Alex Cabagnot finished with 14 points, 9 rebounds and 7 assists, as 3 other Beermen scored in double digits. Shawn Taggart registered 24 points and 10 rebounds for Rain Or Shine, which dropped to 4-3. Maverick Ahanmisi added 16 points for the Elasto Painters, who were out-assisted 25-13. Charles Rhodes (SMB) - 26pts, 6rebs, 2asts, 1blk. Shawn Taggart (ROS) - 24pts, 10rebs, 2blks, 1stl.